With Casegen's powerful interface, the developer has everything he needs at his fingertips. 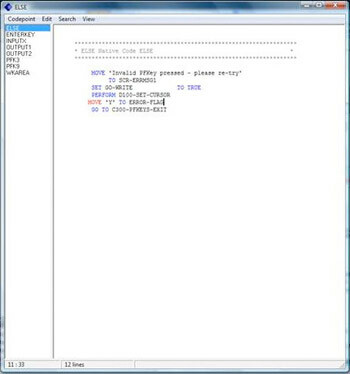 At the click of a mouse from one of the 3 main windows, any and all components of the program can be displayed and in most cases edited. Multiple data, screen and code windows can be open simultaneously, allowing quick development and eliminating coding errors. 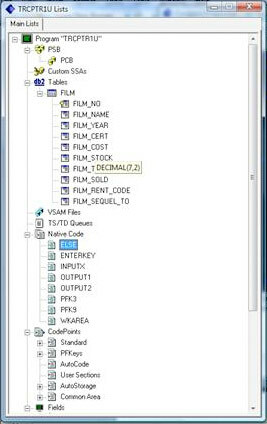 From the Lists menu screen access is given to default program parameters, file and database descriptions, code points, screen field definitions or native code. Simply positioning the mouse over a field or data entity will highlight the data definition and, in the case of screen fields, clicking on the field name will open a further window from which full field attributes can be set. From both the Structure Chart and List windows, with a click of the mouse the Casegen source editor is invoked to display the generated program and create or edit Native code. This editor offers all the usual Windows facilities eg cut and paste but also highlights syntax errors in code as it is typed eliminating time consuming compilation errors later. The third and main window for online programs is the Screen Painter. This window offers extremely powerful screen creation and amendment facilities. Fields can be defined and moved, arrays can be defined and field attributes set in a fraction of the time it would take using traditional mainframe methods. 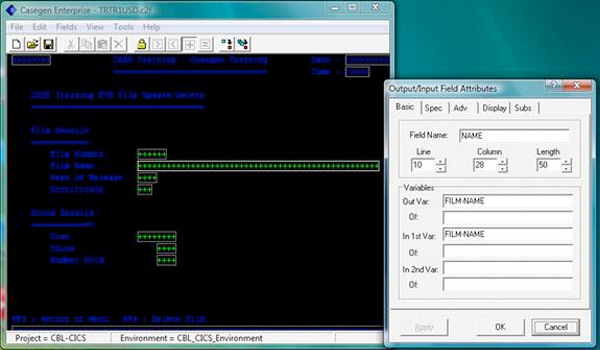 Common errors such as field overlay are completely eliminated.